It is tempting to bemoan the Winter Olympics going to Beijing as another example of unsuitable regimes being awarded the big sporting jamborees. Russia and Qatar are the next two World Cup hosts. After lots of European countries pulled out, Beijing was left with Alamaty of Kazakhstan to bid for the 2020 Winter Games. Urgh, all these dictators. It looks huge – a $5.1 deal, 70 per cent up on the previous one. The English Premier League certainly knows how to sell itself. But amid all the mutterings of how the money won’t filter down to the grass roots and smaller clubs, or Alan Sugar’s lovely image of “prune juice”, here are three reasons why we shouldn’t be surprised. Sky paid £4.2bn for their match packages. Sounds a lot, until you realise that in 2014, Sky made £7.6bn in revenue, and a profit before tax of £1.1bn. Also, this is a three-year deal, so for Sky it works out as £1.4bn per year. In short – the company can clearly afford it. Assuming that the advertisers are still keen, and the public keep subscribing, it could be a great deal. Of course, the extra money won’t be squandered, from Sky’s point of view. Every big money transfer to the Premier League adds to the allure, so they aren’t just spending money on a fixed asset – they are spending on future improvements too. If English clubs can outspend Spanish rivals, it’s basically free marketing for Sky. BT have become a serious football broadcast player. They snapped up the Champion’s League TV rights, and have again bid up for the Premier League. Increased competition over a fixed supply means higher prices, as any economist will tell you. It has a bigger domestic audience, obviously, but the NFL has done a very good job of squeezing the broadcasters for cash, with an annualised $5bn-plus deal with several broadcasters over eight years. While this is about double what the British broadcasters are paying (after converting dollars into sterling), there is a remarkable similarity in the increase from the previous deal. The NFL secured a total $3.1bn TV rights deal for the 2006-13 seasons. That then went up to over $5bn for 2014-21. The Premier League had a £3bn deal for 2013-16, and now £5.1bn for 2016-19. 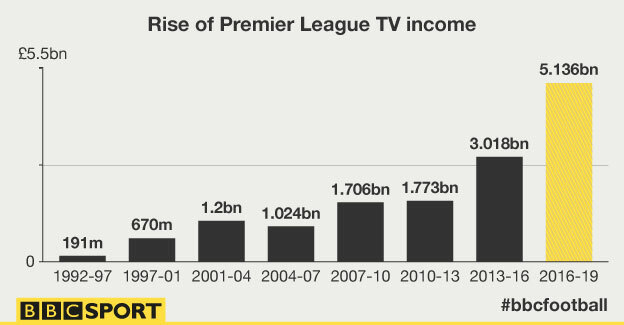 It’s a highly similar increase: 62-plus per cent for the NFL, 70 per cent for the Premier League. Is it such a surprise that sports broadcasters (albeit in different countries for different sports) have upped their valuation of TV rights by the same amount at a similar time? It would be nice to see more money going to places other than players’ salaries and agents. But in a commercial world, the Premier League deal is less surprising than the wide-eyed coverage from the media who run every news snippet about football that they possibly can. In a good but not great Wimbledon final, Novak Dkokovic beat Rafael Nadal today. I was supporting Nadal (actually I am quite a big Nadal fan). So I did what you might call an “emotional hedge” and put a bet on Djokovic to win. Some people see this as heresy. I’m not sure why. For no moment did I stop supporting Nadal. But after the match had finished, I thought – hey ho, cheer up, you made a few bob. Very nice. Not bad odds either, for a 2-horse race, where the outsider had only lost one match all year. So a £50 return improved my mood. Not a fortune, but a decent sum for a small wager. And then I thought – what about Nadal? Is he happy? I doubt it. He has lost the title, and the number one ranking to Djokovic. I’m sure he’s not having a crisis, but he certainly won’t be happy. Yet he’s just earned £550,000 today as runner up. That’s 11 thousand times my winnings today. He’s definitely not 11,000 times happier than me, that’s for sure. Yes, it’s all relative. But I think Nadal would be unhappy today if he got £2 million of even £20 million. His game is now measured in titles, not money. He’s already earned over $41m in prize money alone, let alone sponsorship, so he’s set for life. Which leads me to two thoughts. Money doesn’t make us happy – we all knew that really, so let’s move on to… why are sportspeople paid so much? And so much more than inflation? Nadal as runner up has just won more money than Lleyton Hewitt did in 2002 – less than 10 years ago. (Hewitt got £525,000 for winning, Djokovic just got £1.1m today). Wimbledon has increased prize money this year by 10 per cent for most stages of the tournament (including winner and runner up), and by 8.5 per cent overall. This is much higher than inflation. Why do they need to do it? Is there a prize money race with other events? Does prize money equal prestige? Hardly. Other tournaments offer a lot, but you would have thought the grand slams – which have a joint committee – would conspire not to push up prize money too high. It also seems horribly similar to the corporate world, where CEO pay is many multiples of average workers. The winner earns eight times a losing quarter-finalist. I see the logic in halving the money as you go down the field, but a quarter-finalist has won four matches, compared to the winner’s seven – more than half the entertainment and effort for 1/8th of the money. Is this fair? No. Would the winner be happy with a fraction of the winnings? Yes, I’m sure. So why don’t we change? Why isn’t the money more evenly spread around. It would be interesting to see which players kicked up a fuss. But then again, I’m quietly chuffed with my £50 winnings. It’s funny what a little money can do.